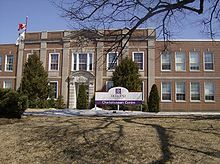 Holland College is the provincial community college for the Canadian province of Prince Edward Island (PEI). It is named after British Army engineer and surveyor Captain Samuel Holland. It was formed by the Government of Prince Edward Island in 1969 as a result of an education reform policy undertaken as part of the Prince Edward Island Comprehensive Development Plan which saw the closure of the province's two post-secondary institutions structured on religious lines, St. Dunstan's University and Prince of Wales College, and the creation of the non-denominational University of Prince Edward Island (UPEI) and Holland College. Holland College offers 75 one-year certificate and two-year diploma programs. The college offers almost $200,000 in scholarships and bursaries for eligible students. In 2010, the college joined Project Hero, a scholarship program cofounded by General (Ret'd) Rick Hillier for the families of fallen[clarification needed] Canadian Forces members. Wikimedia Commons has media related to Holland College. This page was last edited on 24 July 2018, at 23:30 (UTC).